The following is a statement to be delivered by Tommi Makila at the Prince George’s County Council Budget Hearing on April 28, 2015. The views expressed are the author’s own and do not necessarily reflect the views of the owner of this website, Prince George’s County Advocates for Better Schools. My name is Tommi Makila. I live in Accokeek, and my son attends Prince George’s County Public Schools. I am a PTA activist and heavily involved in my son’s school. First of all, I consider improving our schools a high priority. Thus, I want to commend the County Executive for making our schools a high priority. However, I have serious concerns about the school budget proposal. I believe the goals and strategies outlined in the County Executive’s school budget proposal make sense and seem likely to strengthen the school system and improve its performance. However, what seems to be lacking in the proposal is any serious effort to seek savings to fund the new proposals. When you ask for a significant investment in certain areas – significant enough to warrant a 15% property tax increase – I believe you also have the responsibility to look for meaningful savings opportunities in other areas of the budget. Our goal should be to try to minimize, or even eliminate, the need for a property tax increase. Just like any other organization, we will need to prioritize issues. To substantiate my belief that there is room in the school budget to prioritize items without sacrificing our investment in the classroom, I want to point out a couple of facts about the school budget. Between FY2003 and FY2015, total school system expenditures have risen by 685 million. During the same time period, instructional salaries have only risen by 156 million1. Thus, in these 10+ years, expenditures in other areas of the school system’s operations have increased by a total of $529 million. 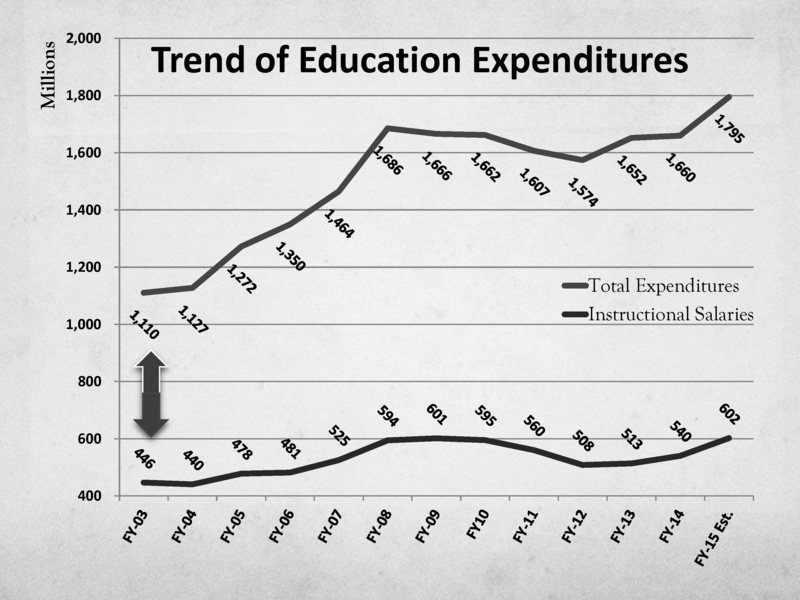 That increase is nearly 3.5 times more than the increase in instructional salaries. Before the school CEO and County Executive are given any more money, we must fully understand where these significant additional expenditures are going. If we can understand this, it will likely reveal savings opportunities that will have minimal impact in our students’ classrooms. Considering the radical nature of the County Executive’s tax increase proposal, I believe your responsibility as the County Council is to thoroughly investigate all other savings opportunities before approving any tax increases. To achieve this, you must demand full cooperation from the school CEO and County Executive to decipher the school system’s budget. My own knowledge about the school system leads me to believe that we could achieve savings in areas such as lessening standardized testing, streamlining and lightening central administration, and leveraging county services and purchasing power for certain items, such as grounds maintenance and snow removal. A thorough analysis of the budget would surely reveal additional opportunities for savings. As a teacher, I agree wholeheartedly with this: “Our goal should be to try to minimize, or even eliminate, the need for a property tax increase. Just like any other organization, we will need to prioritize issues….we could achieve savings in areas such as lessening standardized testing, streamlining and lightening central administration, and leveraging county services and purchasing power for certain items, such as grounds maintenance and snow removal. A thorough analysis of the budget would surely reveal additional opportunities for savings.” If the money was all going to help the students, I would be all for the budget increase. But there is so much bureaucracy and other ways the money is used unwisely and inefficiently.